Pablo Lopez del Castillo was born in Guanajuato, Mexico and has published more than a dozen poetry books and reflections. He has been awarded the American Eagle Award as the most outstanding performer of poetry in Mexico. 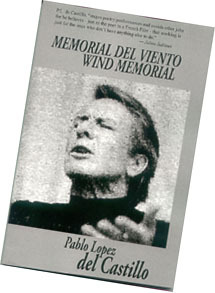 This bilingual edition of Memorial del Viento by Orchard Press is his first book publication in the United States. "P.L. de Castillo, 'stages poetry performances and avoids other jobs for he believes--just as the poet in a French film--that working is just for the ones who don't have anything else to do.'" time travels through the ages. and time is his lament. to describe the infinity and myth of time.